When they take their hobby car out for a drive, there isn't much of a chance David and Patricia Couling will run across any other black Mercury Meteors cruising around Mobile Ala.. In fact, there isn't much chance they will spot a Meteor of any color or vintage. "To the best of my knowledge, there are only three '63 Meteors registered in the state of Alabama," says Patricia. "And we've owned two of the three!" The Meteors are certainly among the more obscure Ford offerings of the 1960s, and go largely overlooked even by die-hard Ford enthusiasts. 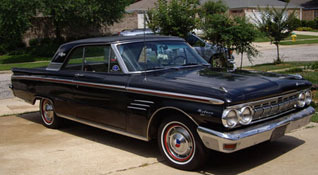 The Meteor line was built only from 1961-'63 and featured lower-end, full-sized vehicles akin to the Fairlane series. Though there seemingly wasn't much reason not to like them, the Meteors never gained much of a following, and disappeared for good after the '63 model year.